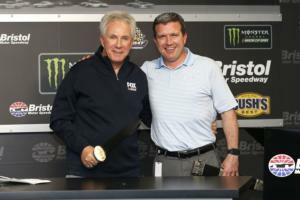 Two of NASCAR and Bristol Motor Speedway's greatest legends, Darrell Waltrip and Bobby Allison, will serve as pre-race dignitaries for the Food City 500. "Food City is delighted to have two of NASCAR's biggest stars serve as our pre-race officials," said Steven C. Smith, president and chief executive officer for Food City. "Generations of race fans have watched Bobby Allison and Darrell Waltrip compete and win races across the NASCAR circuit. With a combined 168 Cup Series wins between them, they are two of NASCAR's greatest. All of us at Food City look forward to the legends being part of the Food City 500." Waltrip, the winningest NASCAR Cup Series driver in Bristol history with 12 victories, will wave the green flag as NASCAR's gladiators begin to battle on the high banks on Sunday, April 7. The NASCAR Hall of Fame inductee, who counts seven consecutive Bristol victories on his resume from 1981-1984, will retire from the broadcast booth later this year. In an ode to his loyal followers in the Volunteer State, Waltrip will give his signature "Boogity, Boogity, Boogity, let's go racing!" call live from the flag stand on the FS1 broadcast. Allison, a four-time Bristol winner, will serve as the Grand Marshal for the Food City 500. The NASCAR Hall of Fame inductee, who won the Spring race in 1969 and 1972, will give the command featuring the most famous words in motorsports: "drivers start your engines." "Darrell Waltrip and Bobby Allison are two true legends of this sport and Bristol," said Jerry Caldwell, executive vice president of Bristol Motor Speedway. "Darrell is a beloved legend at this track and across the Volunteer State, while Bobby remains one of the Speedway's most adored competitors. Along with Food City, all of us are looking forward to having these superstars at The Last Great Colosseum." Tickets for Sunday's Food City 500 begin at $55 for adults and $10 for kids 12-and-under. To purchase tickets to the Food City 500, call 423-BRISTOL or buy them online at www.BRISTOLTIX.com.